Words of wisdom from Matt McGrath, who presumably did not get the memo! "They make a rosy picture of the benefits, which are not fulfilled and the costs are ignored and passed on to society much later," lead author Prof Emilio Moran, from Michigan State University, told BBC News. "Over 90% of the energy from this project is going to go to South Africa for mining and the people in the Congo will not get that power," said Prof Moran. "The people that I study in Brazil, the power line goes over their heads and goes 4,000km from the area and none of the energy is being given to them locally." "The nice goal of rural electrification has become completely subverted by large-scale interests who are pushing this technology, and governments are open to being convinced by them that this is the way to go." "Large hydropower doesn’t have a future, that is our blunt conclusion," said Prof Moran. "To keep hydropower as part of the mix in the 21st Century we should combine multiple sources of renewable energy," said Prof Moran. "There should be more investment in solar, wind and biomass, and hydro when appropriate – as long as we hold them to rigorous standards where the costs and benefits are truly transparent." Hydro power is fine in mountainous areas, like Scandinavia. But many of us have been pointing out the drawbacks in places like Brazil and China, where it gobbles up food producing land, disperses population and causes widespread ecological damage. I’m glad that Matt McGrath has eventually caught up with the reality. In simple terms, you never get something for nothing. The Oroville Dam is still there. I know of 2 in Washington State. Both were old, small, and silted to the point of being useless. These make for good stories, photos, and research. These were so dissimilar from a large modern dam that they are not good precedent. Interesting, if true. This is likely a DC intertie, sending power to where it can be used. If, and when a local grid is in place, some of that electricity can find a local home. Nail hit well and truly on the head. Hydro using dammed rivers isn’t particularly green, can still fail – the power grid collapse as the hydro failed was a main issue in Venezuela’s crisis – and causes conflict with other water requirements/users. Norway gets a high proportion of electricity from hydro and has periodic supply and price problems. The “failure” of hydro in Venezuela was simply a failure of management of the entire electricity system. With other generators taken off line for maintenance issues and lack of fuel, they became over- reliant on hydro and ran the reservoir down too low, forcing cuts in generation until the rainy season replenished the reservoir. Rainfall had been within the normal bounds of seasonal variations. You can have rain in the normal range but if it is in the low range for 3 – 5 successive years, or not in the right catchment, not at the right time of year, you have a problem. The hydro/rainfall shortfall problem went back many years. Venezuela got the majority of it’s electricity from hydro, there wasn’t sufficient remaining generation capacity regardless. Behind China’s ‘renewables’ credentials was a push to exploit just about every possible hydro scheme possible. They have now just about exhausted this. The dirty secret is that this has come at the price of massive destruction of natural river ecology. Good thing all the Chinese sites mining and purifying rare earth metals for wind turbines in the West aren’t causing any ecological damage. Tell me something new. Every ‘green’ energy source/initiative has serious issues when you start to engage your brain. Which as we know is not true. Current series of Abandoned Engineering has a nice dam in it where after it was completed and filled, the hillside promptly collapsed and filled it up. Reminds me of the issues with the Aswan dams on the Nile where their construction has stopped the annual floods which used to deposit a nice layer of silt on the fields to refresh them. Not sure I get your point Gerry. Methane from rotting vegetation/organic matter/soil organisms and the loss of trees fixing carbon dioxide is certainly going to be significant. I thought Prof Moran was taking sense until he got to the bit about “wind, solar and biomass” at which point I question his motives. 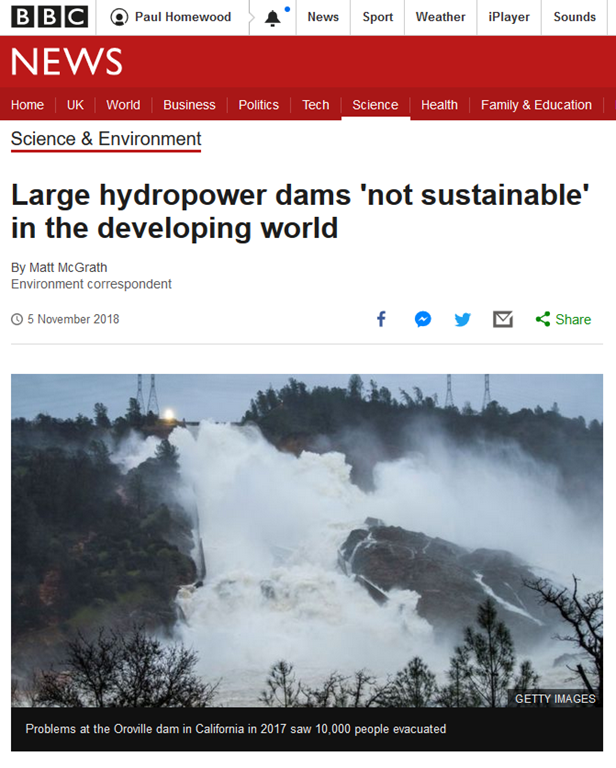 The problem with shortsighted looks at dams as merely hydroelectric, is that most dams serve the twin purposes of generation AND water management. No dam means floods every time there is excessive rain, and no water every time there is insufficient rain. There use in flood control is as obvious as their use in supplying water when needed by people and agriculture, but this is often over looked. They talk about the vast damage of catastrophic failure, but they fail to notice that catastrophic floods after huge storms tend to do the same damage. As long as a dam is properly maintained AND you have good weather forecasting based on reality instead of imagination, a dam isn’t likely ever to be a real problem. It is when your weather bureaus don’t properly forecast major storms and the water they can deliver – as in the case of Oroville, as an example – it is difficult to manage the water behind the dam to help control the water that is about to enter it. Of course, Oroville had other special issues that helped create the situation – mostly mismanagement of the facility. And when it comes to taking out older dams, there is an ecology that has grown up around the dam that is every bit as damaged as the ecology “downstream” from the dam when it was built. Of course you can always make a mess of the construction as with the Hidro Intuango project in Colombia. In Spanish but a rather fuller account than the English version.